Showcase your crochet style every day of the week, every month of the year! Designed to be go-to items in your wardrobe, every pattern in this collection was created to be a piece that you will reach for again and again. 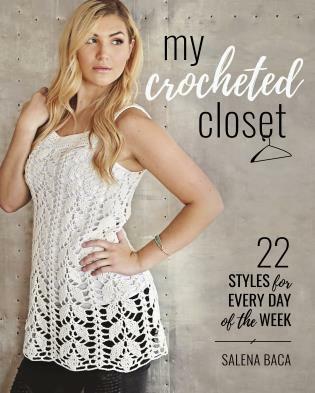 From lightweight tops to shawls, skirts, sweaters, scarves, hats, bags, headbands, and other accessories, the 22 patterns in this book will fill your closet with beautiful crocheted options for every outfit. Dress things up or keep it casual--these pieces are versatile! Combined with the right complementary pieces from your wardrobe, most of these pieces can go anywhere. Detailed patterns and instructions make it easy to crochet them all. Salena Baca curated this collection from 13 of today's hottest crochet designers, including Danyel Pink, Sascha Blaze, Crystal Bucholz, and Julie King. Salena lives, designs, and writes in Bend, Oregon.